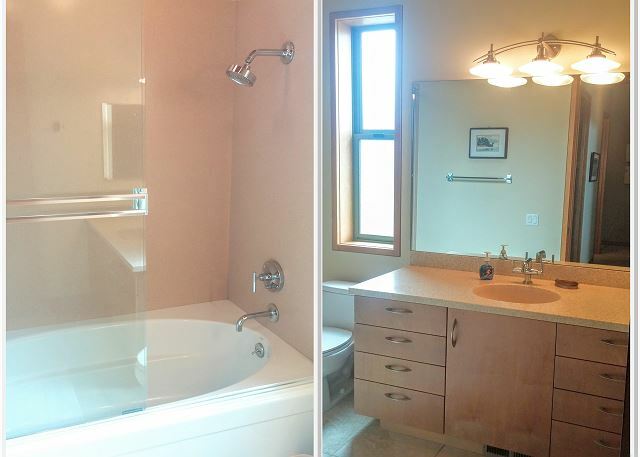 Master bath includes a large Jacuzzi tub and oversized walk in shower. 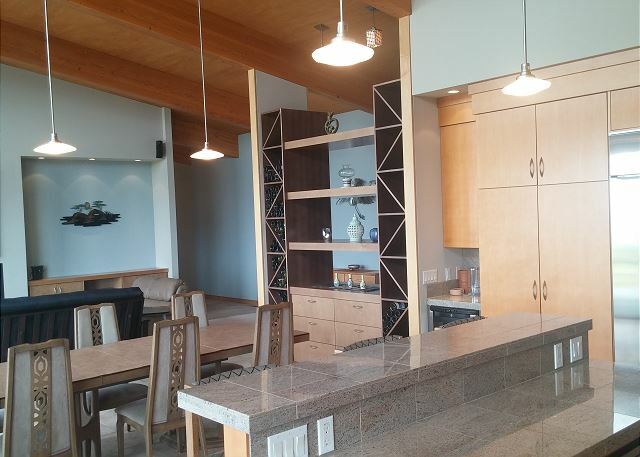 This exceptional home offers expansive ocean and dune views with comfort, sophistication and style. 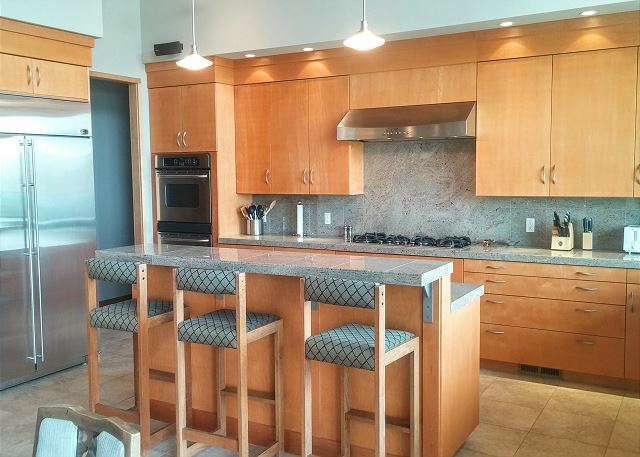 The artfully decorated open concept living area includes a modern kitchen with stainless steel appliances, sleek granite counters, and breakfast bar. 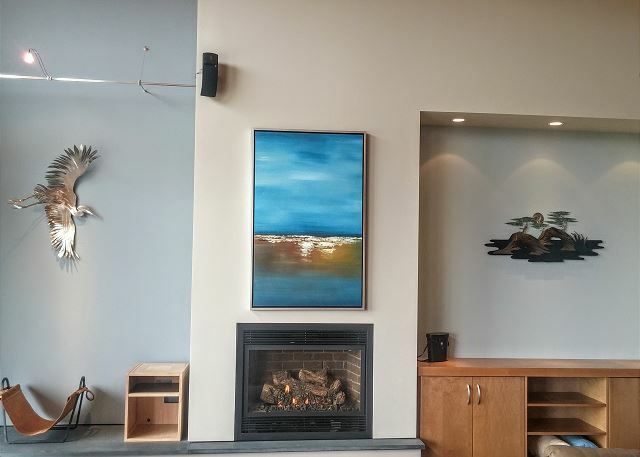 There is a large custom table with high back chairs for a memorable meal and comfortable seating for relaxing in front of the gas fireplace. A row of floor-to-ceiling windows offers open views of the shoreline and Ten Mile dunes, the California coast’s longest dune system. More than 90 species of birds visit or live on the sand and along the cliffs. Seals lounge on nearby rocks, while whales feed and play year-round. This is the perfect setting to take it all in. All three bedrooms have king size beds, their own designated bathroom and double sliding glass doors with those amazing ocean views. Each door leads to the spacious deck that extends the length of the home and offers a gas barbecue, hammock & outdoor dining. 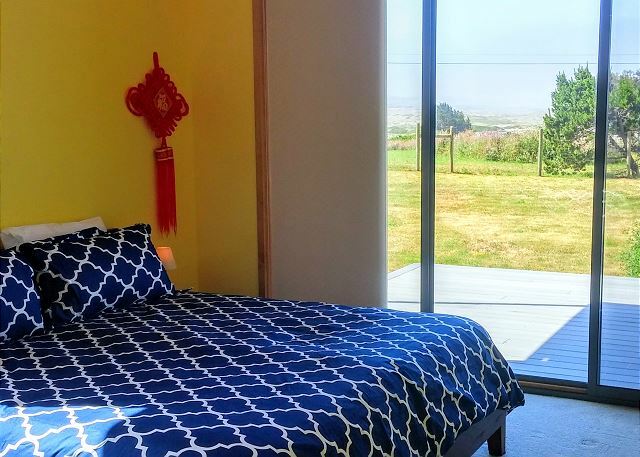 Here, right at the back door, you may enjoy the salty sea breezes as well as the awesome views as you listen to the soothing sounds of the surf. Just a short stroll (less than 500 feet) will lead you to the staircase accessing the beach below. Our stay was very pleasant - house was lovely, well equipped, spacious, clean. When we walked through the front door our mouths dropped! The house was much more than expected. My husband just kept saying wow! We loved the house and did not want to leave. The only things we did not care for was the futon in the living room and the streaming TV. Otherwise, we had a wonderful stay and can't wait to return. Perfect home for our family getaway! 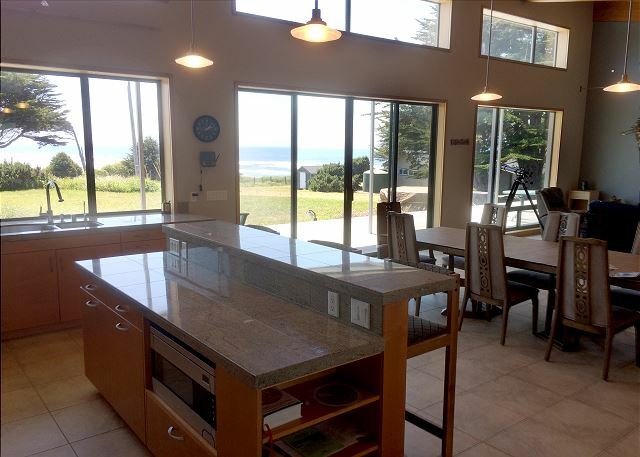 Beautiful, large home for our Grandkids & Kids, it has everything you need & Whale Rock beach is just down the street. We really enjoyed our stay at the Sand Waves. The house is spacious, was clean and stocked with all the amenities we needed. The floor to ceiling windows in each room are incredible and all offer such a great view. The beach is a short walk away so we did not have to drive to the beach which we appreciated. The concrete steps down to the beach are pretty steep though but we just took our time getting down and coming back up. The hot tub off the deck was great too. This property was excellent for our group. 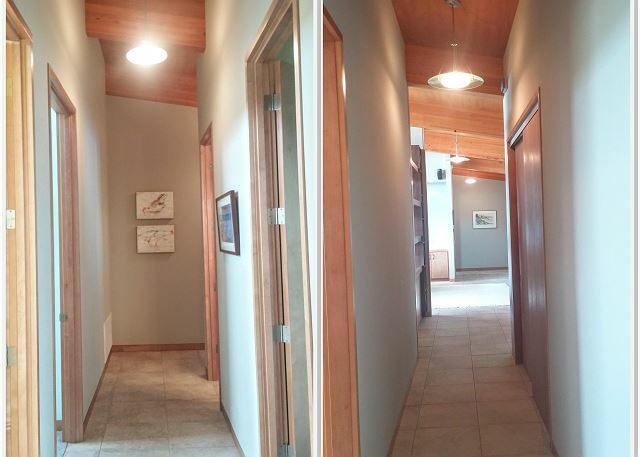 The place was very updated rooms were beautiful and the living space was open and great layout for the group. We loved it and look forward to returning. the rental would be great for a family get for a couple the house was not cozy & more for gatherings than an escape.. Has a wonderful kitchen, bright. Uncomfortable seating in living room.. master bath hot tub didn't work lack of hot water & nor did the TV.. Cheap decorations & furniture.. But a wonderful place for families 3 bedrooms & 3 bathrooms. did not use any of the other bathrooms but they looked very nice,, big tubs & big shower.. it had a small washer & dryer.. & a quick hike to the beach. Loved our visit. 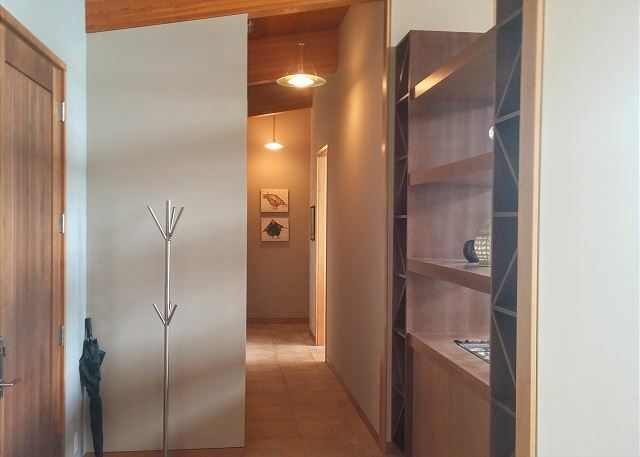 House is very clean and a great layout. Beds are very comfortable and bedding is soft and plush. Nice big showers and the outdoor spa was amazing. The way the cover is, it blocks cars off hwy. Big yard for kids to run around in. Easy access to beach. Safe community streets for exercise/runners. Lots of kitchen appliances, and kitchen items. Washer and drier worked great. Full loads. Rental company was very easy to deal with. Always picked up the phone M-Sat Response time was 48hrs though when a message was left. We called about very minor issues Sunday (maybe they where closed?) and didn’t hear back until Tuesday. Came and fixed issue within a couple hours. Internet was slow. Even when it reset at the beginning of the month it had speed issues. There is only one TV and it’s in the living room and shows would stop quite a bit. Amazing! 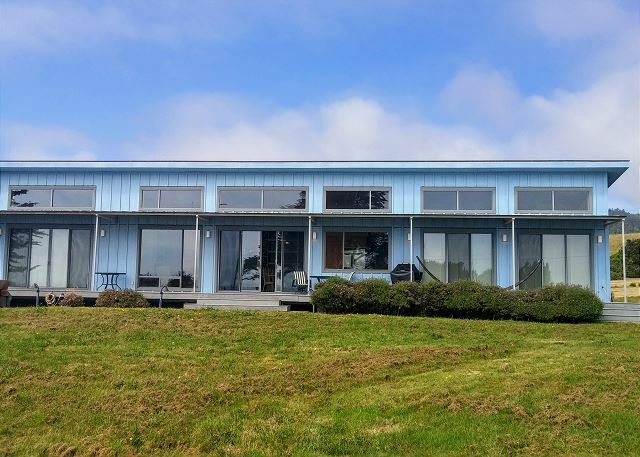 Don't be fooled by the modest exterior of this vacation home. You open the front door, and you are in a mansion! It is truly amazing. Everything was perfect. Everything worked. We didn't need anything! What a gift! House was great. Dogs and kids loved the quiet beach (even on July 4th). Saw many deer and foxes in the backyard overlooking the ocean. Would definitely return. Exactly as advertised! Clean throughout. Well equipped kitchen. Rapid response to small matters (no sound on TV and small leak under sink). GREAT dog beach. Hope to visit again! Great place to stay and relax. Would stay there again. We had a great time and loved the location. Great beach! 6 girlfriends, great company, great food and wine. Relaxing, tranquil and great views. This coastal oasis home is beautiful, peaceful and relaxing. We loved the clean, upscale feel of the home. 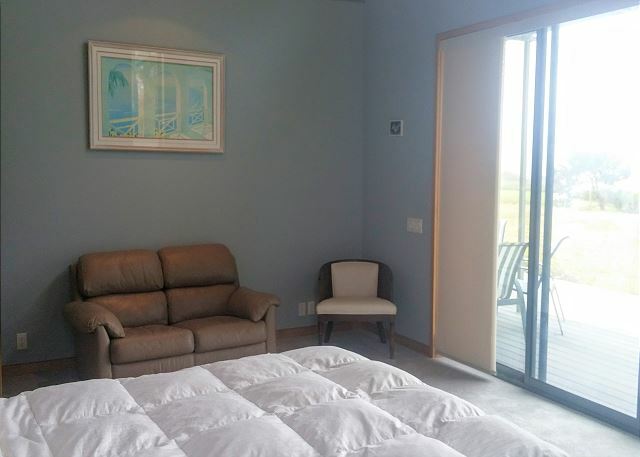 Three master suites, each with ocean view are a special feature of this home. A short walk to the stairs and you are on the private, dog friendly beach. 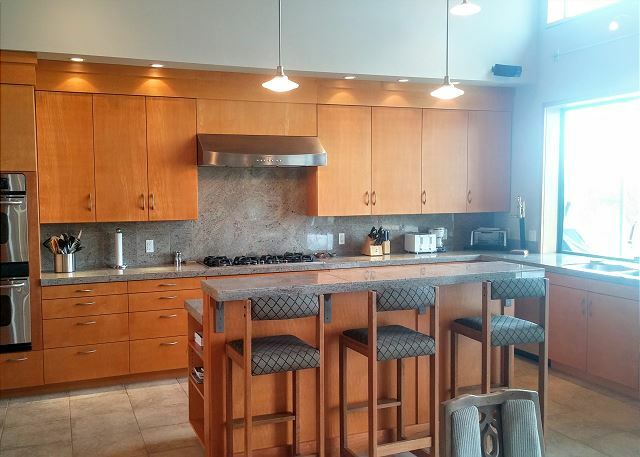 We loved the high-end kitchen and all of the personal touches. Internet access, but slow. Tried to watch a movie, but the continual buffering made it too tedious. If you don’t want to watch tv, this is not a problem. We will be back for sure. Such a beautiful home! Large enough for a family getaway or a group of friends. Bathrooms are so new & spa like! Kitchen is so well stocked with all your cooking needs & so roomy. The beach access is so close & what a BEACH!! Loved the high ceilings in the home. Kitchen was great. Access to the beach was awesome. Views from home of the dunes and water made it easy to tell if it was high tide. Our dog loved playing on the beach. Quiet neighborhood. Tv didn't work right. Screens from master and living room aren't attached well so be careful sliding them open. Didn't use the hot tub as it is not private...neighboring property in full view and road to other property not blocked with views of the highway. Inside the home was very comfortable. 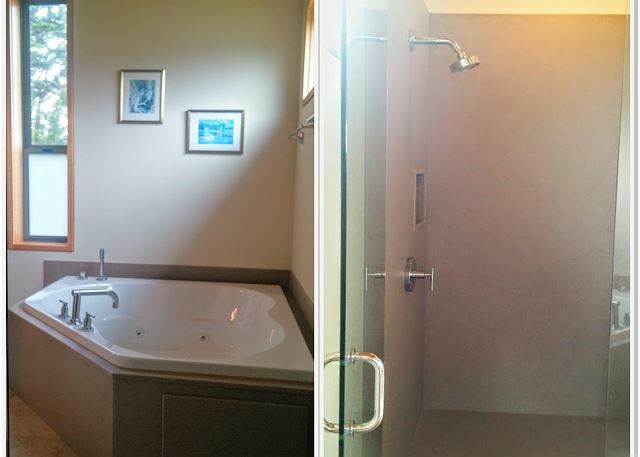 Nice showers, plenty of space and beautiful large windows for views of dunes. Would absolutely stay there again. Sand Waves was outstanding! 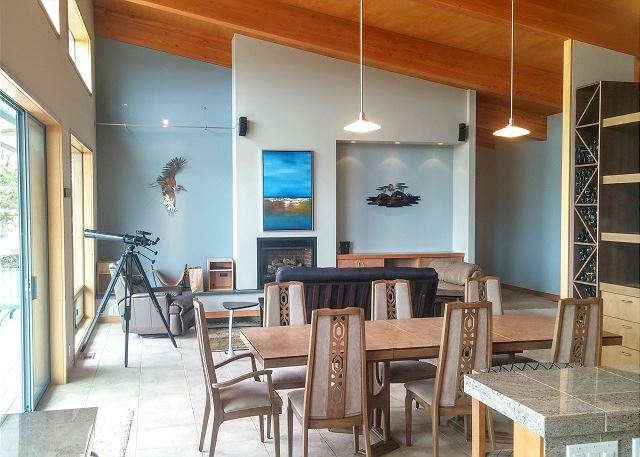 The house is ideally situated for a getaway gathering of family or friends. 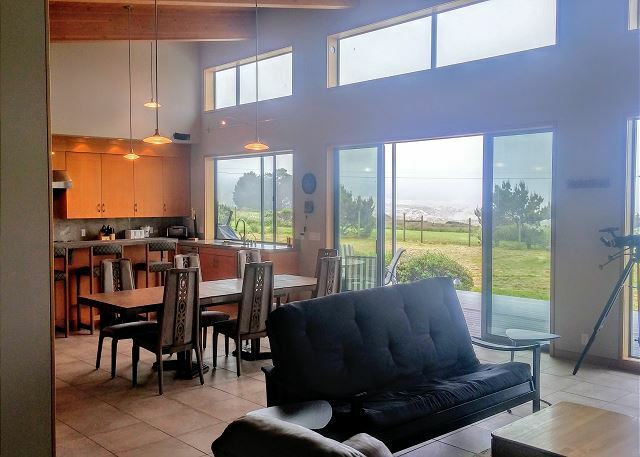 The open kitchen and great room offer a perfect place for conversation and group dynamics, and the all-glass wall draws your eye to the stunning landscape of land and ocean. We made our way down the stairs to the beach, only to discover more beauty that we'd thought possible. The sunset was incredible, and the beach perfect for exploring and photos. Mendocino Rentals took good care of our arrival and staying experience. I can't recommend this home away from home enough! Lovely, nice home next to a beautiful and peaceful beach -- what more could anyone want? Beautifully remodeled interior, resembles what one would find in a contemporary design 5 star hotel. Doesn't have cable but has streaming TV where you can login your accounts (like Netflix/amazon/vudu etc) and watch what you want from there. Good wifi too. Kitchen with all of the dishes, utensils, pots & pans, and other essential equipment, especially the awesome Brewstation coffee maker. The large back patio faces the dunes, ocean and trees. Great place to sit and watch the sun set every evening. A 1 minute walk down the road leads to a private beach access with one of the few off leash dog beaches in the area. 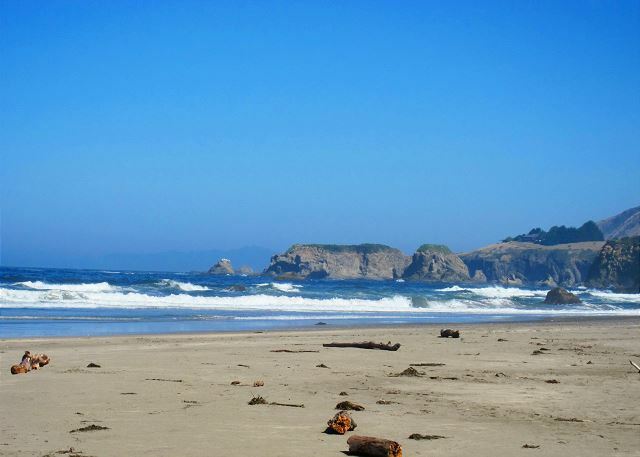 Also a 5 minute drive to Mackerricher state park which has plenty of hiking trails for humans and pets. Very quiet/private neighborhood. Perfect beach/coast/cool weather retreat. FIVE stars!